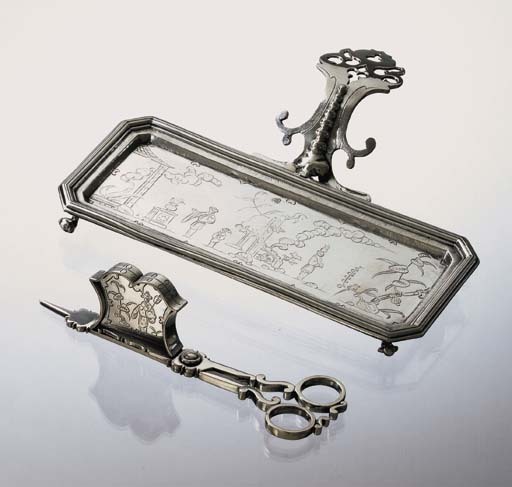 A similar Chinoiserie snuffers tray and snuffers with the same maker's marks of D script and WB, was sold from the Jaime Ortiz Patiño Collection of 17th Century English Chinoiserie Silver, Sotheby's, New York, May 21, 1992, lot 151. Another similar tray with snuffers of 1683, maker's marks IH and WB, is in the Metropolitan Museum of Art and was previously sold from the collection of Lord Astor of Hever at Christie's, London, May 15, 1963, lot 108. A set of 1685, with the tray maker's mark B and the snuffers WB, were sold as part of a service in the collection of the Earl of Harewood, Christie's, London, March 13, 1957. The present example is distinctive in its use of fire and smoke motifs referring to its function.